The cattle guard rattled while crossing onto the graveled road through green pasture to the picturesque homestead where Dr. Phil Phar sure enough answered the doorbell. 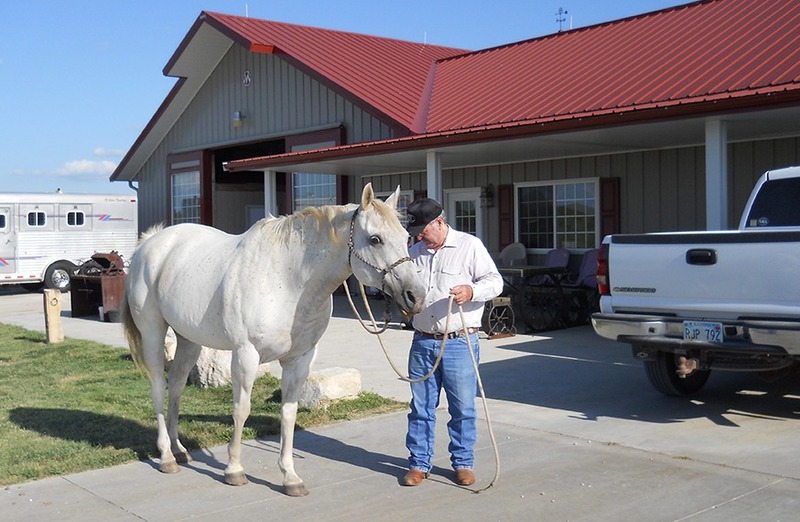 Renowned livestock nutritionist Dr. Phil Phar is with his horse, Flint, in front of the home-barn headquarters just north of Council Grove. “I’ve lived here six years. I like western Kansas, but it can’t beat these Flint Hills,’ surmised Phar as he sat down on a plush leather couch in his quaint, immaculate cowboy home with attached five-stall horse barn. It’s really 135 acres of formerly just native pastureland a short distance north of Council Grove in Morris County. Today, a couple more matching tan metal storage structures, a storm shelter, Buford the mechanical roping dummy and a big arena complete headquarters of Phar, Inc., the business for which the PhD nutritionist is known throughout the country. “My sons, Matt and Justin, live at Olathe, and I’d always been doing cattle business around here, so I feel fortunate to have bought this place,” related Phar, who moved from his home and horse facilities on 20 acres at Scott City. Contending his initial mounts were incomparable in ability to the pair in his barn today, Phar still followed his cowboy instincts to complete undergraduate animal science education at the University of Illinois. “They had a few good King Ranch and Peppy-bred Quarter Horses, and I was fortunate to have the opportunity to work with them,” Phar informed. Graduate studies were at Kentucky where Phar completed his degrees and came to Kansas State University when offered a position. “As I was driving down the highway, got to about Maple Hill and saw these Flint Hills, I knew this was where I wanted to be,” Phar revealed. That was 1966, and he served as the first feedlot specialist at K-State. “I was really on the ground flour of the feedlot industry in the state,” Phar pointed out. “Crofoot at Strong City along with Winter and Brookover in western Kansas were the biggest feedlots around at that time,” Phar said. 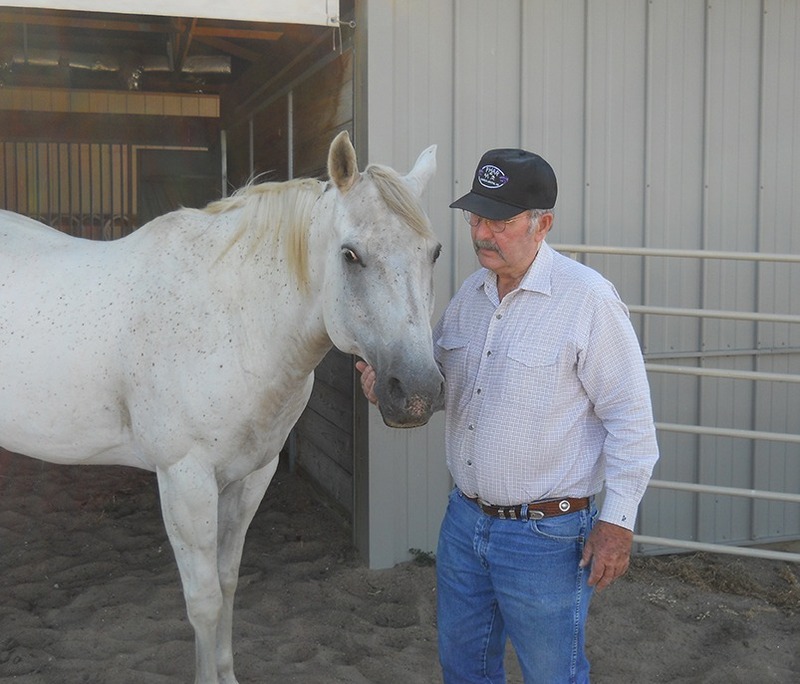 During his time at the university, Phar had horses, roped some, helped ranchers, judged local shows and served as faculty advisor for the Chaps (rodeo) Club. Obviously, feedlots were a fast-growing industry, and by 1972, Phar was in demand to assist managers in formulating nutritional needs of cattle on feed. “I moved to Scott City and started my consulting business,” he said. Feedlot operators, stocker producers and cow-calf programs in several Midwest states sought Phar’s nutrition advice. While providing others with nutrition knowledge, Phar was also in the cattle business personally and developed feedstuffs now familiar to many. A photograph in one of the albums tells a story he’s pleased to share. Leading Quarter Horse trainer Billy Allen had some of the top horses in the country three decades ago, and Phar developed the ration now merchandized as Billy Allen Horse Feed. “We were in a partnership, and I designed the mill still operated by that feed business,” noted Phar, who dispersed his interests to Allen. Dr. Phil Phar, Council Grove, talks about his career serving the Midwest livestock industry as a nutrition consultant. During his diverse cattle endeavors, Phar worked with and became good friends with Kenny Berg. “When Kenny settled back at Manhattan, and was looking after lots of grass cattle, we developed a Rumensin-based mineral that other cattlemen soon wanted to feed, too,” Phar remembered. Manhattan Milling manufactured the product for Phar and Berg, who became partners in the Bluestem Mineral business. The Phar place at Scott City was popular for the cowboy crowd. “I always had cattle for roping, and several nights every week during the summer, there would be a group there for practicing,” commented Phar, who competed in team roping jackpots and feedlot ropings consistently for a number of years. His sons learned to ride and rope, and still have an appreciation for the sport. Always with a soft spot for helping anybody with a cowboy spirit, Phar said, “I usually keep a few Corrientes here, and sometimes have practice sessions. “Cooper Martin and Brant Mahanay just got from a national junior rodeo. They come here fairly regularly,” he added. Phar’s two grandsons sometimes ride when they visit. “The one wanted to take a horse when we went to a youth rodeo the other day, so they might become cowboys sometime,” Phar granted. When ropers come by to practice, Phar will often saddle one of his horses, help pen steers and maybe shake out a loop if the mood strikes. “I don’t really ride all that much nowadays, but I’ve got a great pair of geldings,” he insisted while praising them as they appreciated evening feed. A sorrel 12-year-old Smart Little Lena-Peppy San Badger gelding, called Buddy, had experience before Phar got him and complements the older horse, according to their owner. In addition to the two saddles in his home, Phar’s working tack is kept in one of two trailers in the barnyard. “I’ve always liked and had good equipment,” insisted Phar as he showed the saddles custom made by J.M. Capriola and John King. “My saddles have slick forks and narrow seats. That makes a big difference in how they fit, and how they ride,” Phar evaluated. A couple of the bridles hanging in the trailer are equipped with rawhide bosals that Phar braided personally. “I like to work with leather,” he said as showing breast collars he’d designed and cut out personally. Reading has always been important to Phar. “I read at least two books a week. I need to take some of these to the library,” he said. 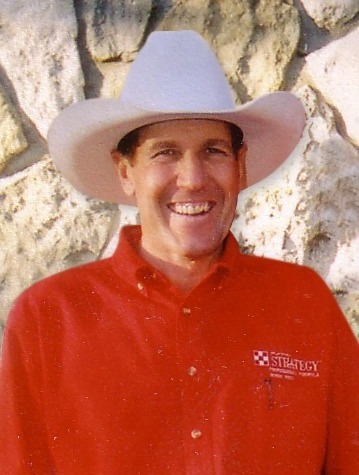 A past chairman of the Kansas Livestock and Meat Industry Council, Phar has maintained ties to Kansas State University. “It’s sure fun living in Kansas and working with all of the good people,” Phar concluded.